That was the simple—and surprisingly complex—question at the heart of the 2015 Diversity Symposium. Keynote speaker and advocate Thomas Smith viewed the issue as a matter of triumph through adversity, while University of Massachusetts faculty member Dr. Kerrita Mayfield saw it as a problem of integrity. 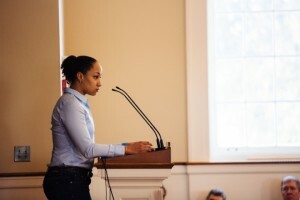 In their student addresses, which began a day of workshops, Maranie Harris-Kuiper ’15, Verdi Degbey ’16, and Cameron Stanley ’16 strove to answer the question through the multifaceted lenses of race, culture, sexual orientation, and religion. Before Thomas Smith began his address in Phillips Stevens Chapel— before he had even said a single word—the assembled Williston Northampton students and faculty gave him a rousing ovation. What had the audience found so moving? Mr. Smith’s simple act of ascending to the stage, which he accomplished by bypassing the stairs and rising on the chapel’s brand new wheelchair lift. That Mr. Smith, the Diversity Symposium keynote speaker and a quadriplegic, could access the stage smoothly and easily was worth applauding. The new lift, part of an extensive, year-long chapel renovation project, was the final piece in a retrofit puzzle that made Phillips Stevens Chapel completely accessible for the first time since it was constructed in 1965. 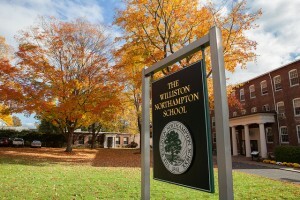 This year, the Williston Northampton School is unveiling a new approach to the start of school, called Welcome Days. After hearing from families that the growing number of checkpoints and stations during registration were causing delays, Williston’s administration decided to speed up the process. Rather than going through multi-stage registration in the Reed Campus Center, families will instead stop briefly in the Grubbs Gallery to confirm that they have completed their health forms, permissions, and payments. They will then proceed to the Dodge Room, where they will receive a tote bag with their new Surface, pre-loaded with required programs; their room keys or key cards and IDs, also known as Sammy Cards; the Student Handbook; and their academic schedules. Director of Parent Relations Rachel Goldberg said she hopes Welcome Days will help families get right to the most important stage—meeting faculty and moving in. For the past year, the Communications Office has been working on a new website, featuring a fantastic new look by the Boston-based firm Stoltze Design and a content management system by Finalsite, a company that works specifically with and for the education community. With a planned website launch on April 5, we are excited to preview just a few of the website’s great new features with you! 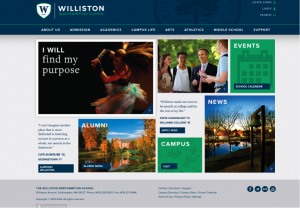 The new homepage design is a sleek and streamlined introduction to the school, inviting new visitors to dig deeper. We’ve added more profiles, doorways into large amounts of content, and pop-up features, such as the I WILL statements. 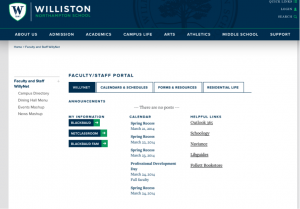 Finalsite’s robust search function will help users quickly find what they need, while a login button gives those familiar with the school direct access to WillyNet. All the content remains the same—we’ve made sure documents, forms, and links in the old WillyNet are still there in the new—but functions available on Finalsite let us display it in a much more user-friendly and helpful way. Quick links can be found on the WillyNet landing page, while documents are sorted in the forms and resources tab. The left-hand navigation also offers easy access to mashup pages, the campus directory, and dining hall menu. Williston hosts four acclaimed authors this fall as part of the 14th annual Writers’ Workshop Series. Each author will offer public readings and discussions of their work. The series kicks off with author Lynne Barrett on October 4 at 7:00 p.m.
All presentations, which are free and open to the public, take place at 7:00 p.m. in the Dodge Room of the Reed Campus Center at The Williston Northampton School. For more information, please call 413-529-3311 or email twolfe@williston.com. Lynne Barrett is the author of three story collections, The Secret Names of Women, The Land of Go, and Magpies. She co-edited Birth: A Literary Companion and The James M. Cain Cookbook. Her work has appeared in Delta Blues, A Dixie Christmas, Miami Noir, One Year to a Writing Life, Ellery Queen’s Mystery Magazine, Night Train, The Southern Women’s Review, and many other anthologies and journals. She has received the Edgar Allan Poe Award for best mystery story from the Mystery Writers of America and a fellowship from the National Endowment for the Arts. She teaches in the MFA program at Florida International University, edits The Florida Book Review, and lives in Miami. Andre Dubus III is the author of a collection of short fiction, The Cage Keeper and Other Stories; the novels Bluesman, House of Sand and Fog, and The Garden of Last Days; and a memoir, Townie. Published in 20 languages and made into an Academy Award-nominated motion picture, House of Sand and Fog was a finalist for the National Book Award, the Los Angeles Times Book Prize, and Booksense Book of the Year. It was also an Oprah Book Club Selection and reached #1 on the New York Times bestseller list. Dubus has been awarded a Guggenheim Fellowship, the National Magazine Award for fiction, and the Pushcart Prize. 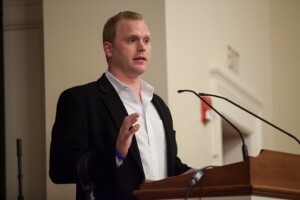 He is a member of PEN American Center, has served as a panelist for The National Book Foundation and The National Endowment for the Arts, and has taught at Harvard University, Tufts University, Emerson College, and the University of Massachusetts Lowell where he is a full-time faculty member. Nikky Finney is the author of four collections of poetry: On Wings Made of Gauze; Rice, recipient of a PEN America Open Book Award; The World Is Round, recipient of the 2004 Benjamin Franklin Award for Poetry; and Head Off & Split. She also wrote Heartwood, a collection of short stories for literacy students, and edited The Ringing Ear, an anthology of African American poets writing and reflecting on that historical American geography known as “the South.” A recipient of the Kentucky Foundation for Women Artists Fellowship Award and The Governor’s Award in the Arts, Finney has taught at Smith College and Berea College, and is a former faculty member at Cave Canem, a writing home for African American poets. She is presently professor of creative writing at the University of Kentucky. Alison Pace is the author of five novels: If Andy Warhol Had a Girlfriend, Pug Hill, Through Thick and Thin, City Dog, and A Pug’s Tale. Her essays have appeared in several anthologies including It’s a Wonderful Lie: The Truth About Life in Your Twenties, Everything I Needed to Know about Being a Girl I Learned from Judy Blume, and Howl: A Collection of the Best Contemporary Dog Wit. She lives in New York City where she teaches creative writing and is at work on another book.